Frank Martin, Interim Director of the Birmingham-Jefferson County Transit Authority (BJCTA), last month spoke during a two-hour meeting held by the League of Women Voters of Greater Birmingham (LWVGB) at the BJCTA Administration Building in downtown. Since UAB is such a big employer here . . . what has the transportation system done to bring the employees in and to make it timely? And what is the percentage of people that use it? 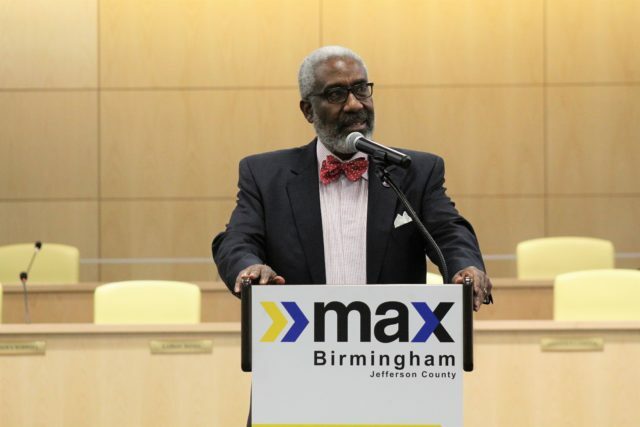 Martin: I’m not really sure the percentage of people that are using public transit who work at the University at Alabama of Birmingham but I would say that I actually recently had a meeting with their transportation management person. And we’re working to see how we can collaborate. Now the University of Alabama at Birmingham has their own little transit system…at one point BJCTA use to operate that for them, I’m not really sure the reason why we no longer are doing that, however, whenever that contract comes up for bid again, we will bid on it. More importantly the officials at UAB are very interested in reducing the number of parking garages that they built. . . . They would also have a bus bay over here at Central Station so their bus could come in…they also talked about…a number of their employees live in Hoover, Vestavia so we may be able to identify park and ride locations where they can park their cars and then get on the bus and then we would bring them down to the campus. So we are really working to see what we can do for the student and their faculty and all their employees that work there. We just might be able to do something by the fall, that’s our goal. Do you or do other cities consider Max Transit a public service . . . How [do we] approach our mayor, and city council, and our legislators to let them know that we definitely need better transit service and it has to be funded as a public service? Martin: Having been in the industry for 40, 45 years I firmly believe that transit is a public service. When you look at other transportation type services be it aviation or roads, whatever, a lot of those modes get their funding from the gas tax. So there needs to be a constitutional amendment to make sure that transit could be a part of that funding source to get money. Alabama is one of the, I think three or four states in the country that does not provide…capital funding for public transportation and that’s something that really needs to change. And I would say that while some of your comments may be falling on deaf ears, don’t give up, take more people with you when you have those discussions. What is the reason for the long wait times and the poor on-time performance? Is it poor equipment? Is it not enough ridership, Is it work ethic — and do we have to wait till 2021…to begin to see an improvement? Martin: I’ve been asking that question ever since I’ve been here . . . [and] I have not gotten a straight answer yet. We do have a shortage of operators and that’s usually the first response I get as to why we’re not maintaining a decent on-time performance rate …although we’re down operators, that’s not the real reason. I think over the years there’s been a relaxed culture and work ethic, quite frankly, that’s not been customer friendly and we need to get back to providing a quality service by making sure that the operators understand the need to meet their time points.